If you are looking to gain the CRC (Certified Rehabilitation Counselor) certification, you’ve heard of the magnitude of change it can make for someone in this industry. This certification carries high esteem among the industry from employers to the patients you serve on a daily basis. If this is something you are interested in, make sure you are as prepared as possible because the CRC exam is known to be very difficult. The difficulty of the exam is really why the CRC credential holds such an elite standard in the industry. Therefore, be sure to start your study with plenty of time before the exam with the proper study materials. As far as great materials that can be used to prepare test takers for this exam, our free CRC practice test displays a comprehensive view of the scope of the exam. It will accustom you to the wording and formatting of the exam questions you’ll see on test day. To maximize your preparation, certain exam standards are important to know. 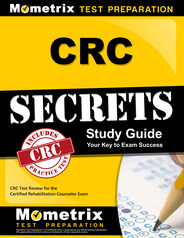 The CRC test contains 175 multiple-choice questions that must be completed in 3 1/2 hours. The minimum passing standard for each test is set by the number of correctly answered questions a panel of experts deemed a minimally competent test taker would answer correctly. For this reason, each test can have a different passing score. With that said, the test is broken into two sections: knowledge of counseling and knowledge of rehabilitation and disability issues. Both sections of this test must achieve the predetermined passing score to pass the exam. With this in mind, make sure to change your preparation to account for this. 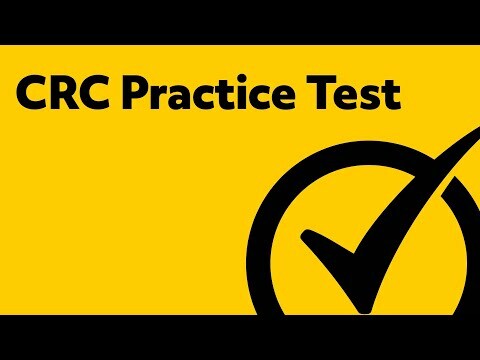 If you are unsure of how prepare, try our CRC practice test sample questions below! The questions will show you what to expect on test day. If you like what you see, be sure to check out our complete CRC practice test. Mometrix Academy is a completely free CRC certification resource provided by Mometrix Test Preparation. If you find benefit from our efforts here, check out our premium quality CRC study guide to take your studying to the next level. Just click the CRC study guide link below. Your purchase also helps us make even more great, free CRC assessment test content for test-takers. Our customers love the tutorial videos from Mometrix Academy that we have incorporated into our CRC study guide. The CRC study guide reviews below are examples of customer experiences. Great basis for building a structured preparation and review for the exam. Gives solid outlines of the major areas to be assessed, and helped me “knock the dust off” some areas I was weak on. Went on to pass with flying colors! I enjoy the format of the study guide and how it separates the subjects clearly. One of my issues were that all of the information is jumbled in my head. This helps in organizing it for me. It is clearly written and helps in grasping a better understanding of the knowledge I’ve already studied in other formats. I would refer this material to other students. It’s perfect! It was very instrumental in preparing for the CRC exam! I would definitely recommend this book for anyone studying for the CRC. This book helped me pass the CRC exam. I am glad I bought it! I have found it to be both thorough and comprehensive. I have increased my effectiveness in taking the CRC (through many practice exams at different points with scores going up) each time. I feel confident that I will be able to pass the CRC exam easily when I take it officially due to the information and guidance found in the CRC Exam Study Guide. I have been busy studying the CRC Study Guide and Flash Card to prepare me for the CRC examination. The information is superb, it narrows down the broad unnecessary material that is useless. The secrets found in this guide will motivate you to do your very best. This is a sure-fire motivator. It helps you to overcome testing fears and guides you into self-talk when it comes to focusing on getting the right answers through the process of elimination. It is easy to read and follow and gives a lot of examples on counseling theories, etc. I feel that this study guide will help me pass the CRC Exam.